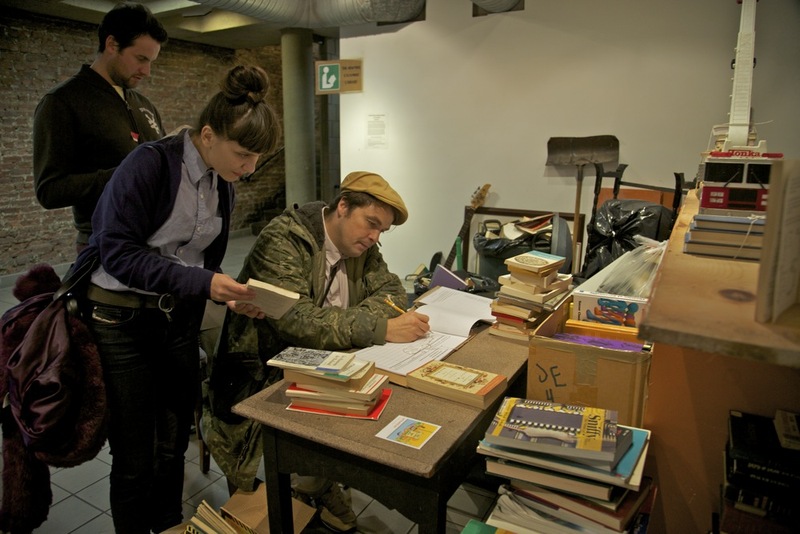 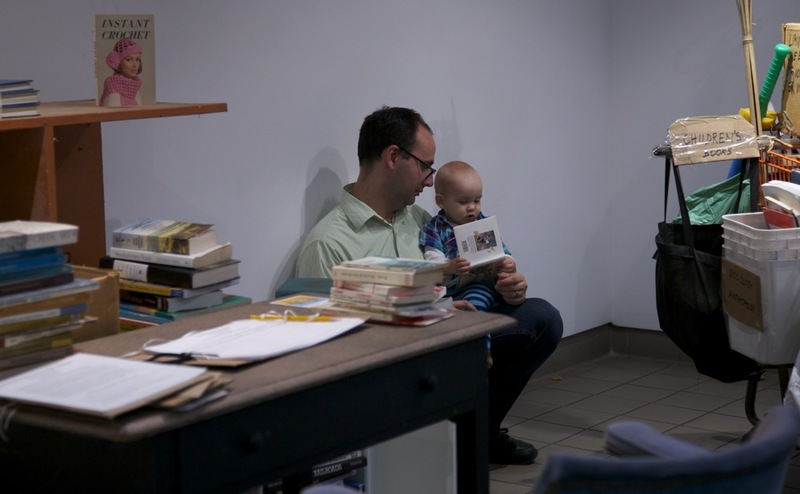 The Exchange Library is an interactive platform for sharing and redistributing discarded books. 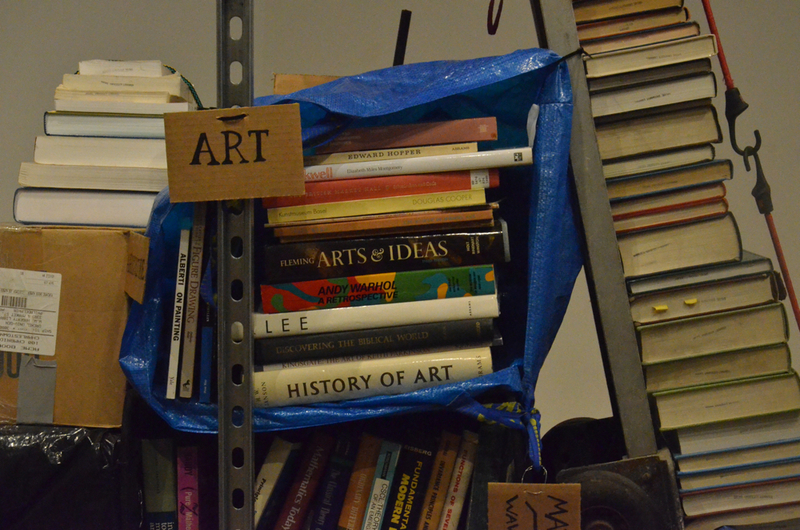 The project explores possibilities to access, exchange and save books that for various reasons are unwanted, rejected or thrown away. 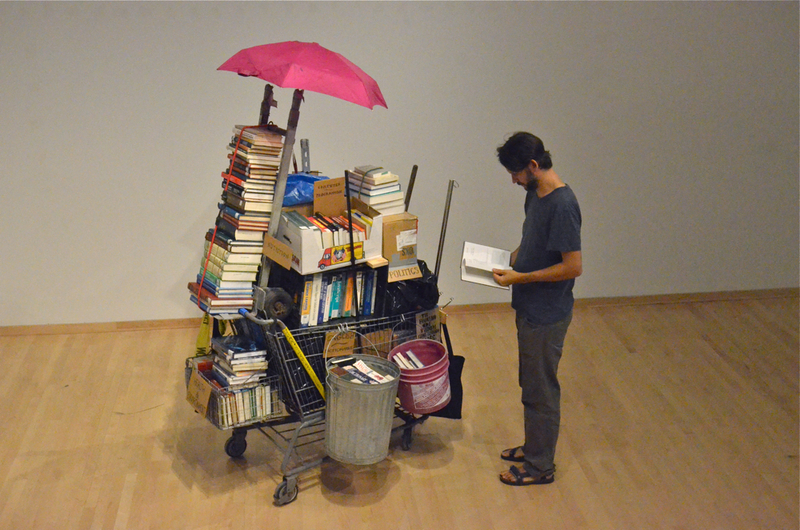 The Exchange Library installation takes a form of a movable library, utilizing a supermarket-shopping cart with various containers attached to its main structure that function to store and organize books into collections and genres. 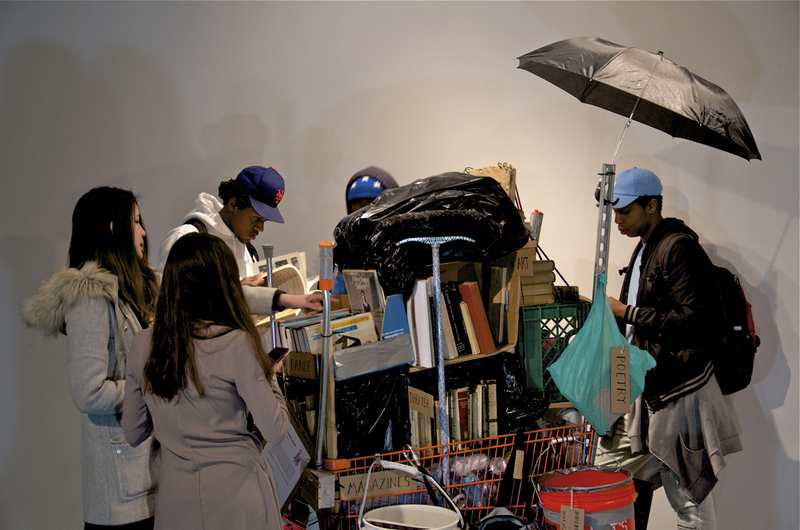 The system of categorization is inspired by the esthetic and logic used by the garbage scavengers and homeless people, who often build elaborate storage and organization systems on their carts to create a resource for a variety of valuable objects from the trash collected on the streets, including books. 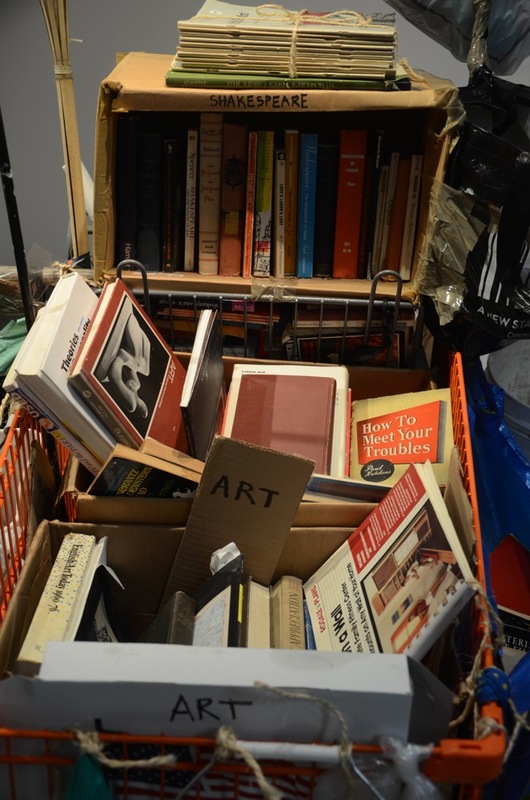 The project is open to interaction and encourages the participants to take and donate books following the Exchange Library Rules. 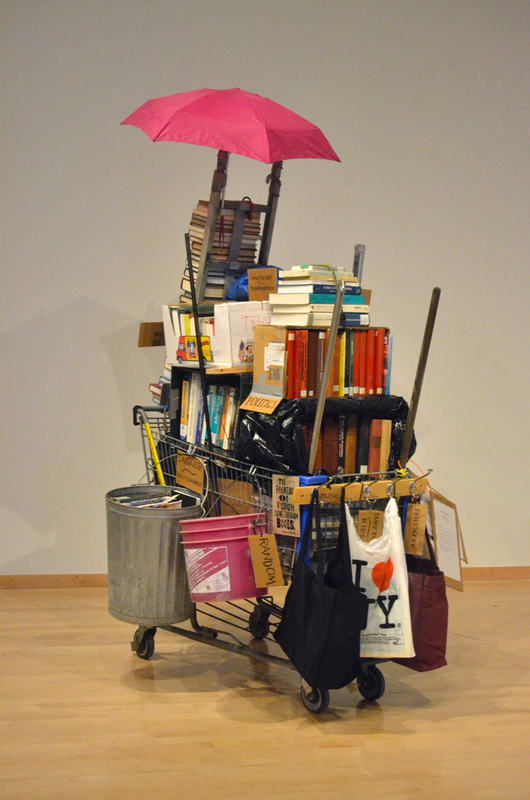 The project follows the narrative of life of books, in which knowledge, ideas and culture undergo similar destiny to our personal belongings and household objects, as they spin in the consumerist cycle. 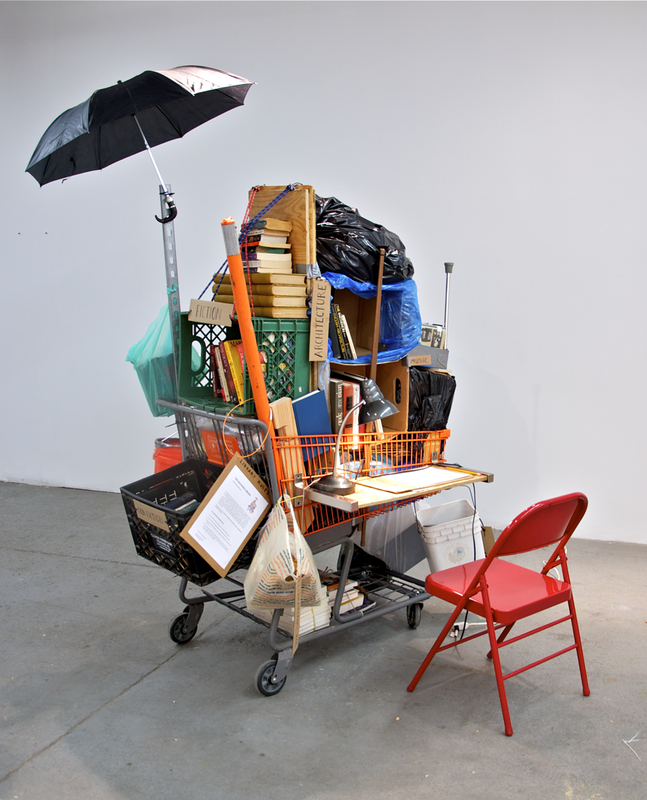 It points out the impermanence and the interchangeability of things as well as ideas, which we deem for permanent. 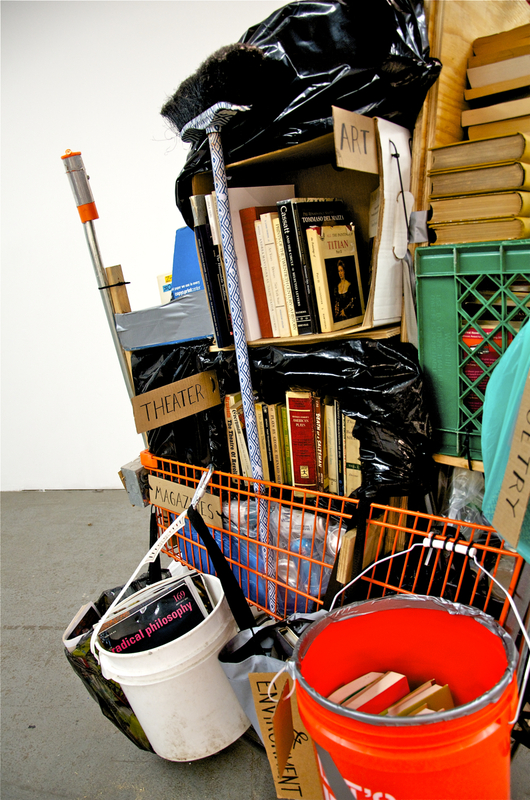 But in reality, the ownership and lifespan of these objects is relatively short lived, leading to gradual obsolescence, ambivalence and final rejection. 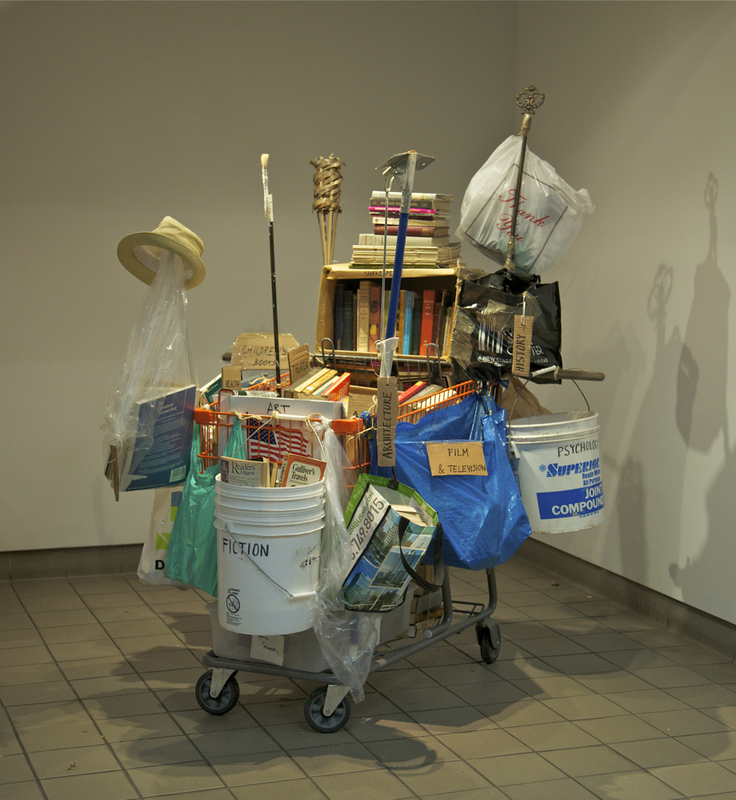 The use of the supermarket-shopping cart, the ultimate tool and symbol of consumerism, becomes a symbolic gesture reversing the paradigm of the consumerist cycle from a passive role in to an active model, serving to save, repurpose and redistribute. 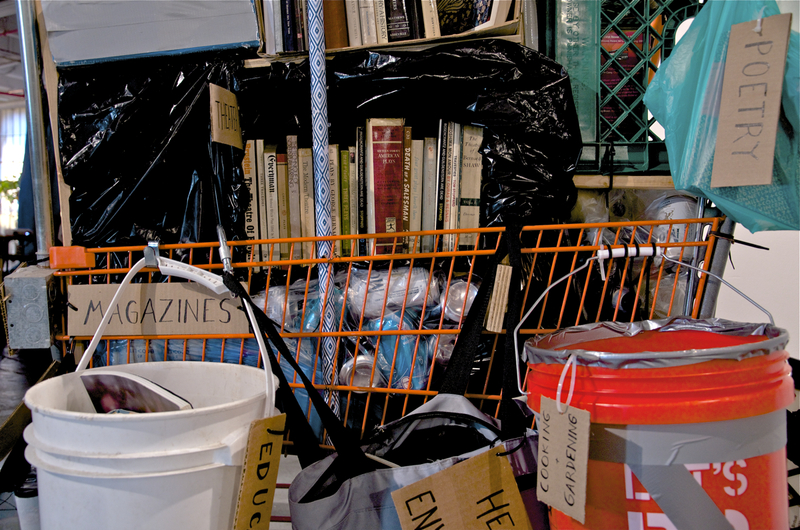 “We designed Exchange Library as a place to explore the mechanism of salvaging cultural capital and knowledge versus the notion of abandonment and refusal. 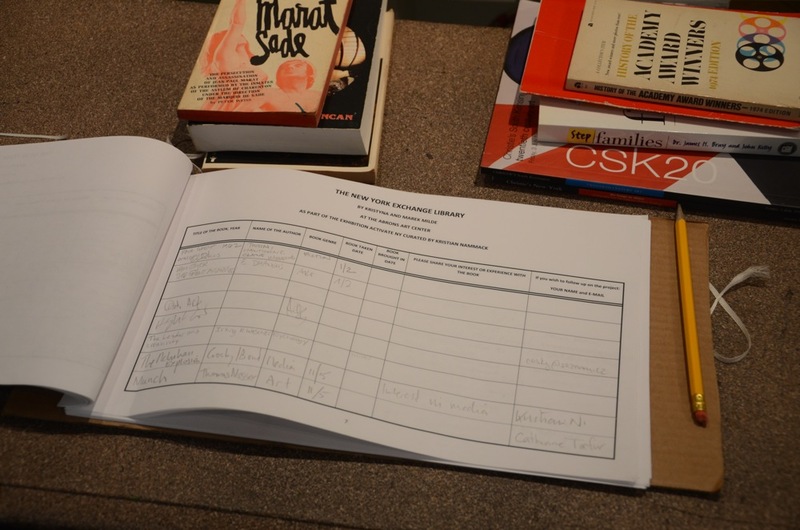 The books here are objects that trigger the ultimate call for a decision to be adopted or refused, which metaphorically extends to its content, stories and ideas, ” said the artists. 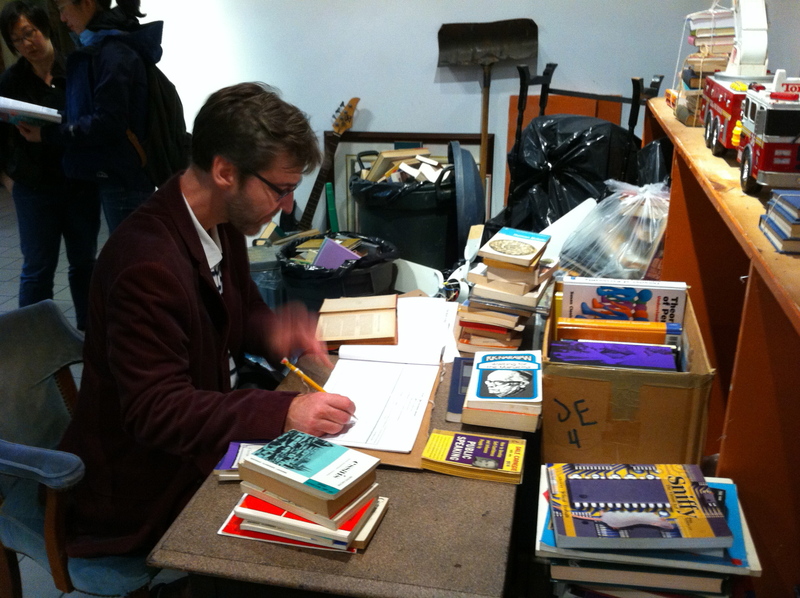 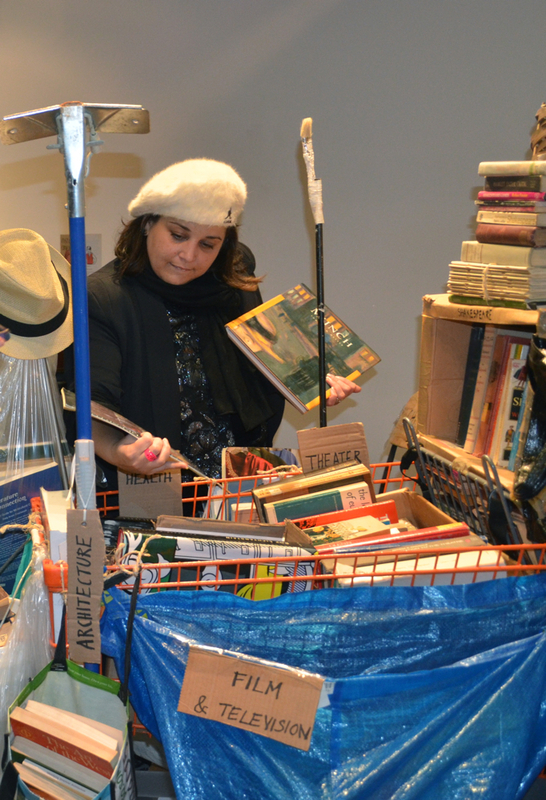 While the Exchange Library gives an second chance life to the used books, it also functions as a metaphor for active intervention and the possibility to transform the fast-paced cycle of consumerism. 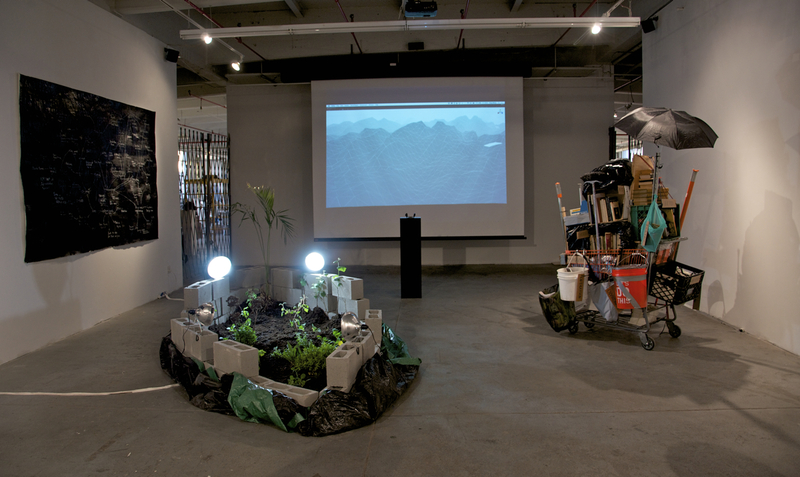 Serving as resource and an alternative model of distribution, the project creates situation that allows one to contemplate the permanence and impermanence of values both material and immaterial. 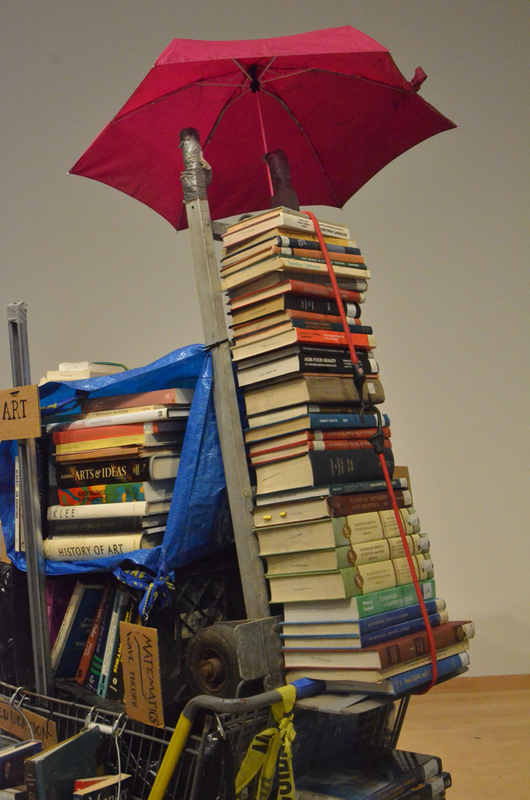 The project is open to interaction and encourages the participants taking and donating books, following the Exchange Library Rules. 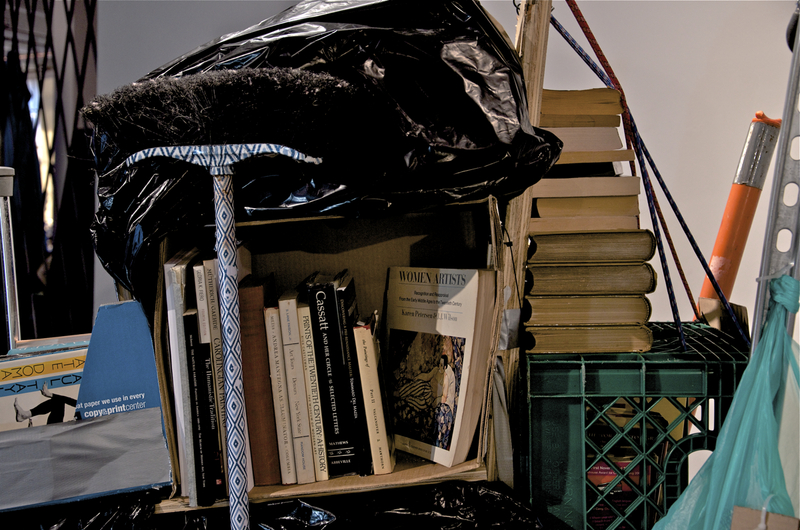 You are welcome to bring and donate your book(s) and add it to the library. 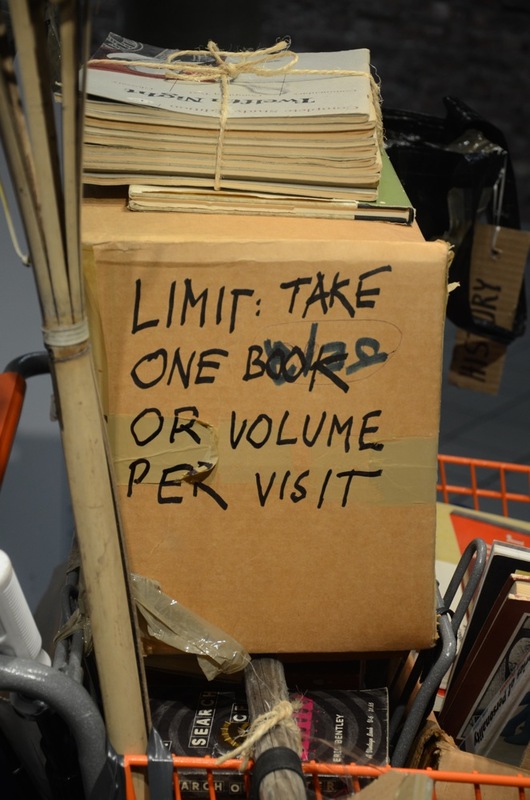 Please keep track of the books you take or bring by recording it in to the diary. 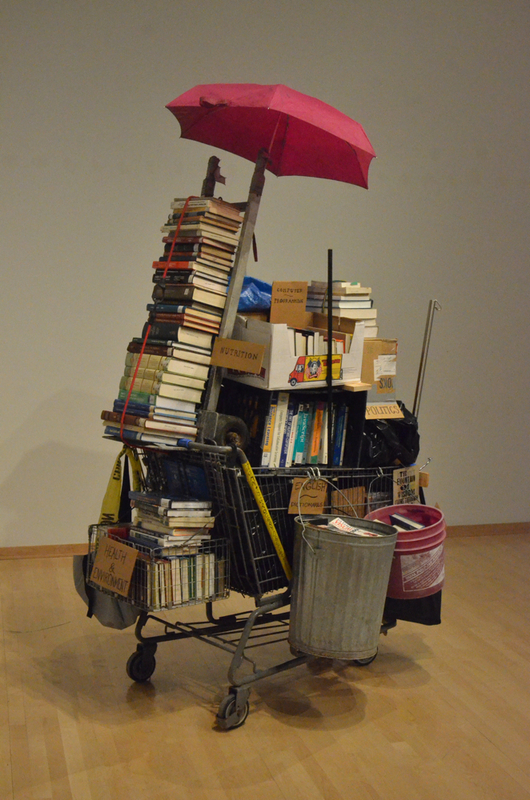 You may become a librarian and categorize books in genres, marked on the shopping cart. 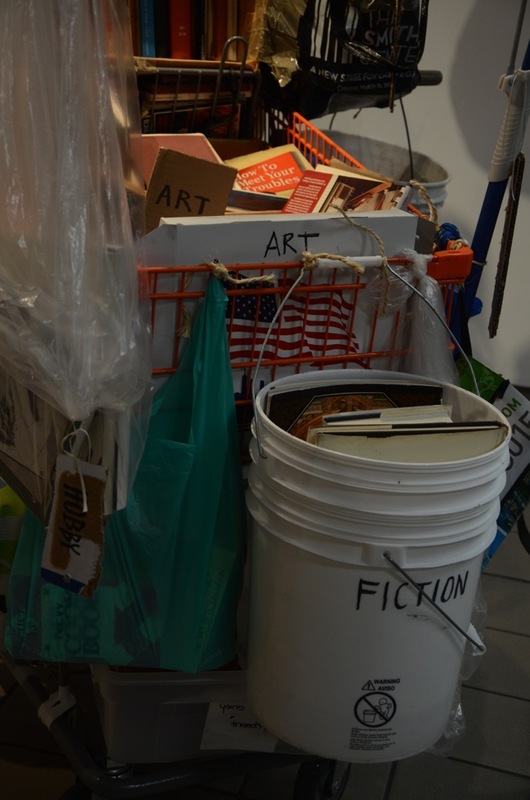 If the category does not exist, create new category, making a sign and attaching it to available bags or appropriate container. 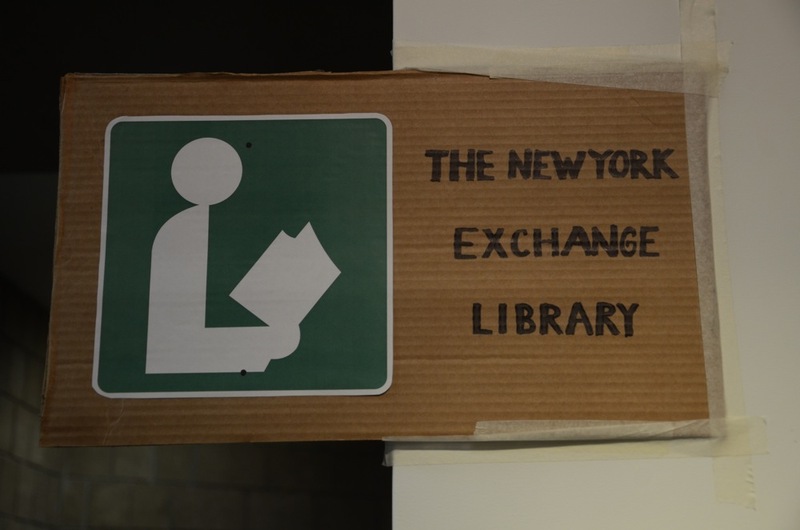 The project The New York Exchange Library explores concepts and possibilities of access to knowledge, openly shared as a free resource, versus information as a commodity owned and marketed for a price reflecting today’s mechanism of consumerism and culture of disposal. 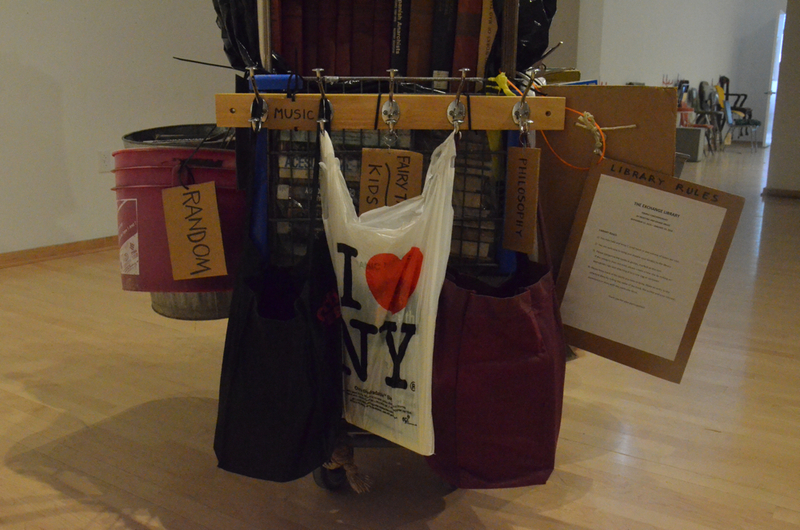 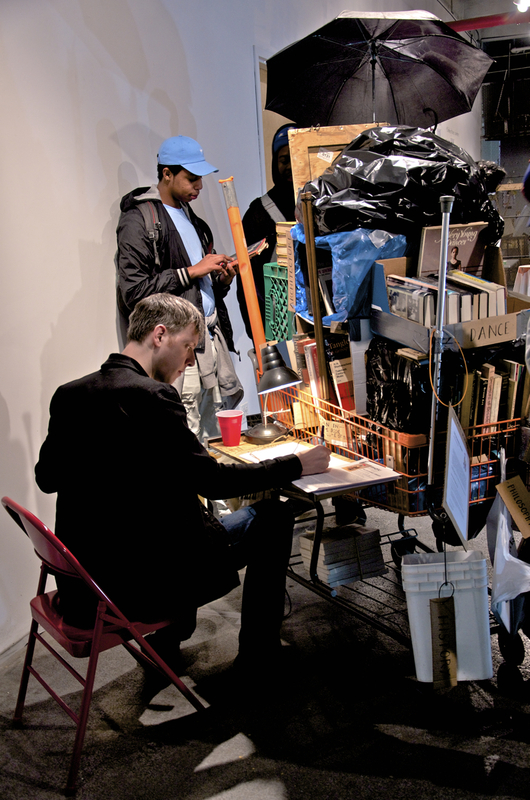 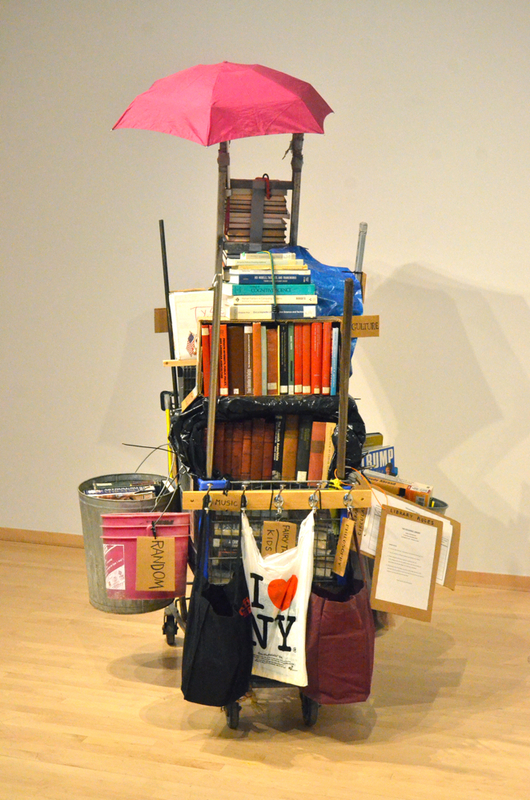 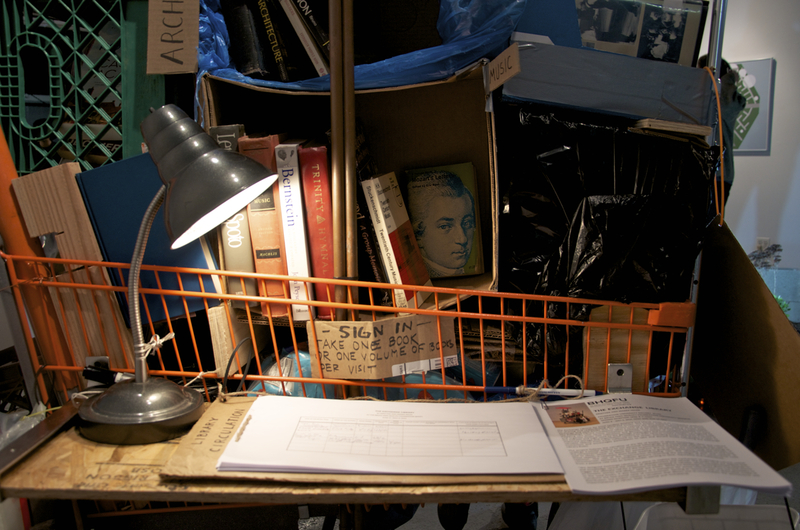 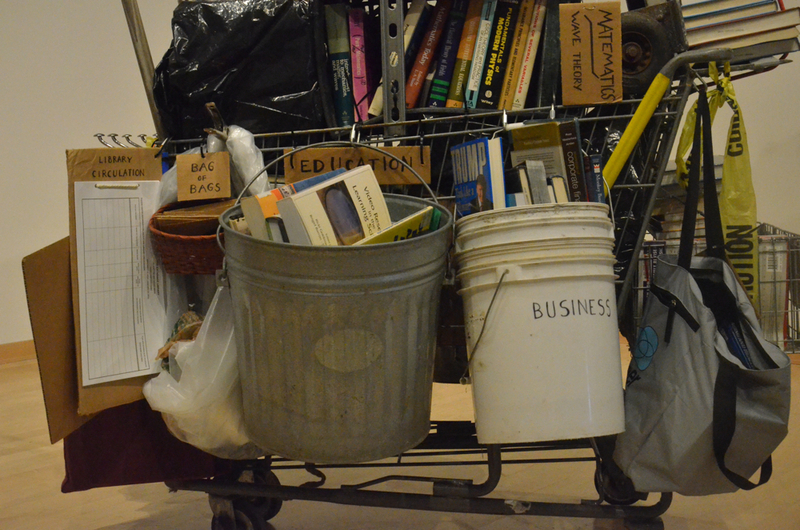 The installation takes a form of a garbage pile as it can be found on the streets of New York City, where books among other household objects can be found and obtained for free. 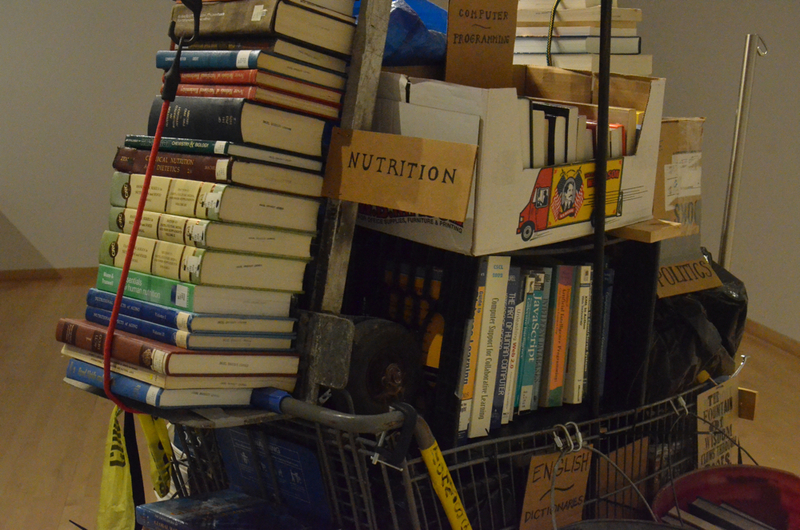 Shopping cart full of books is parked close, where the books are categorized into collections and genres as it would be by a librarian or nerdy street garbage scavenger. 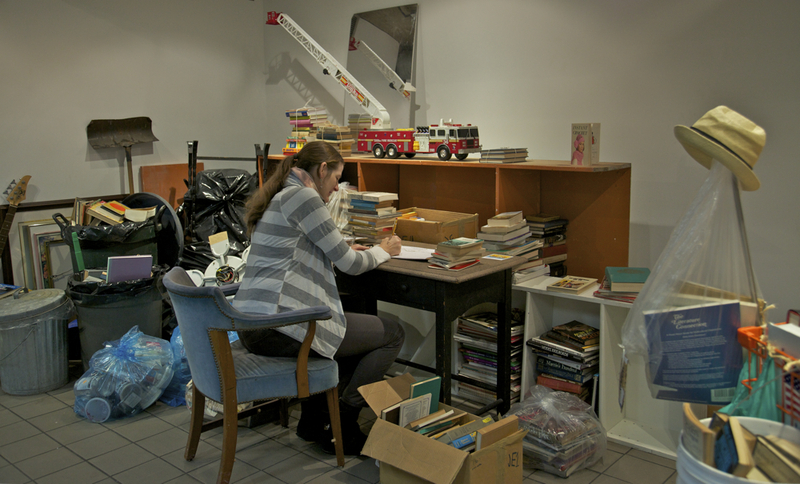 The project is a situation open to interaction and offers the participants the possibility to seek, categorize and take or bring the books and also donate new inventory (Library rules apply). 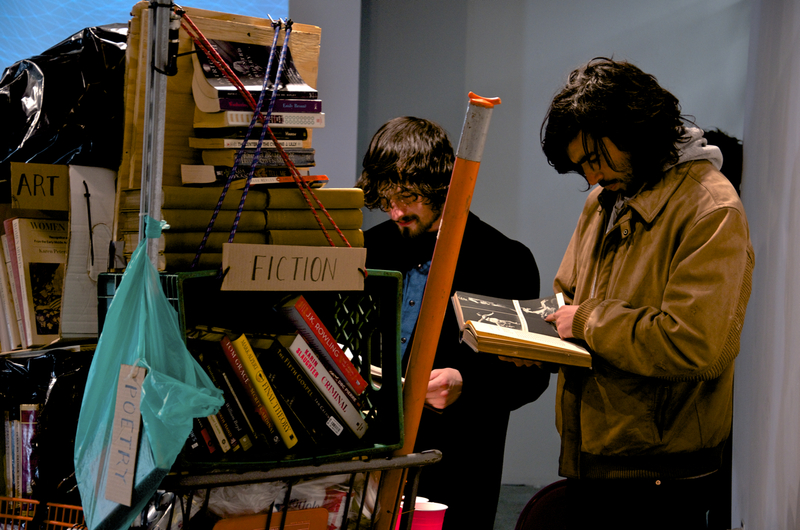 The project follows the narrative of the life of the books, in which knowledge, ideas and culture undergoes similar destiny of the stuff spinning in the consumerist cycle.